Learning geography has never been so fun! Younger players will learn all about the contiguous 50 while older players will test and refresh their memories. Players will need to know how to read and have some basic geographical knowledge. Quick trivia: Do you know the capital of Iowa without Googling it? Nah, neither do I, but I bet your school-aged kids could name it for you. If not, sit them down in front of the iPad and introduce them to this fun and educational app. 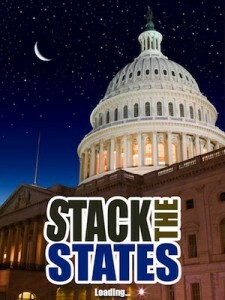 Stack The States takes geography out of the classroom and plants it right at the tips of your fingers by testing one of the most important learning tools outside of the iPad – your brain. The actual game itself is pretty simple – answer questions about any of the 50 United States and pile them up until they cross the line. At first the questions were pretty simple, like naming state capitals or choosing which state borders another. The harder questions included state recognition by shape which can be tricky because there are a ton of states that are rectangles. Before I actually dropped the states on the platform I was able to rotate or move them because they’re gone forever if they fall off the side. The size of the states are in relative proportion to each other, and I was lucky enough to be right about Texas on the first try. As I completed each round I earned a state and after collecting enough I could move on to another unlocked game. The next game to unlock was Map It, where I was challenged to locate a specified state on a map. Pile Up followed, where I had to quickly sort through a jumble of falling states by name to avoid the pile from growing too high. The last two games are Puzzler – fitting the correct states together with their neighbors – and the conveyor-belt style Capital Drop matching states to their capital cities. 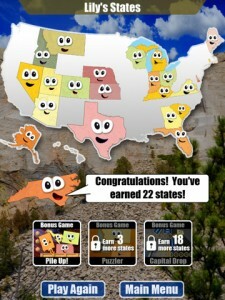 Each game required more states to unlock and increased in difficulty and pace. Now, this is not a game for your young non-readers to play independently, but elementary and middle-school aged children will find this a good way to learn without being bored out of their minds. Obviously players need to be able to read but they should also have some intermediate geography knowledge. 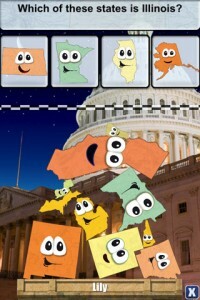 The US map is fundamental, and it helps for kids to know state flags, capitals, and nicknames. There is a lite version available if you want to try it out but that only includes the title stacking game. 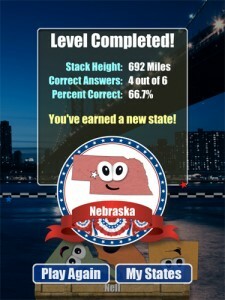 For the download price this app really packs a punch as a supplemental learning tool, and you’ll amaze your children with your vast knowledge of state capitals.